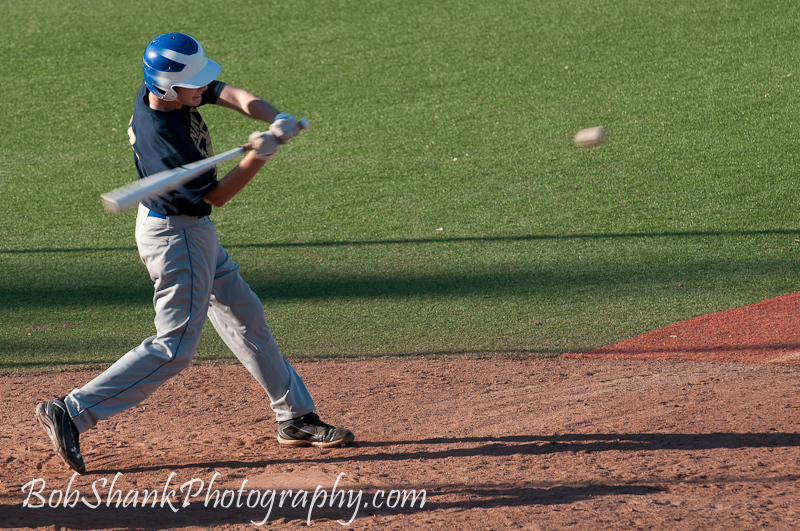 Last night at the Legion Baseball game, I tried a new angle from which to photograph. I’ve been doing some experimenting with shooting the pitcher from behind the backstop and shooting through the chainlink fence. It is not my favorite spot by any means, but I am getting some interesting and different perspectives from this location. 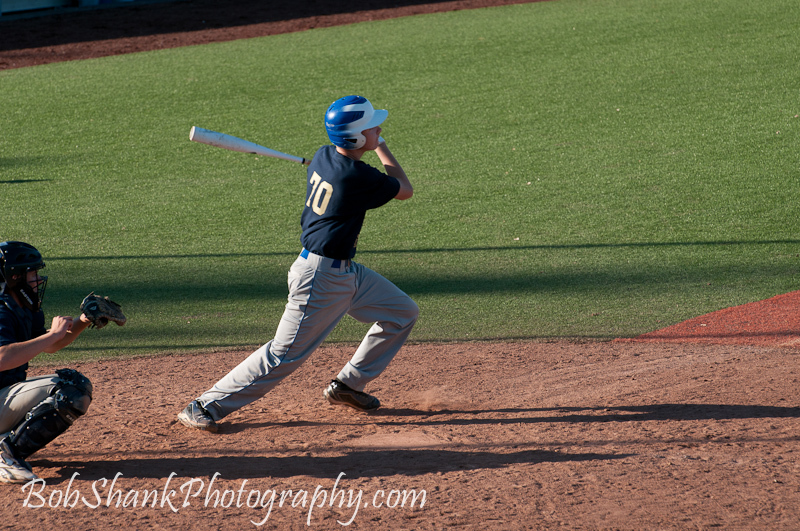 The pitcher, Dylan Pasnak, was striking out a lot of hitters so there wasn’t much fielding action with the infielders. One inning I decided to go behind the backstop and take some photos of Pasnak throwing strikes. I did, but then I tried this angle with the batter swinging at the ball and missing. My goal was to get the ball in the photo before it got to the catcher’s mitt. It took some trial and error to time the shot, but I got pretty close with this one. 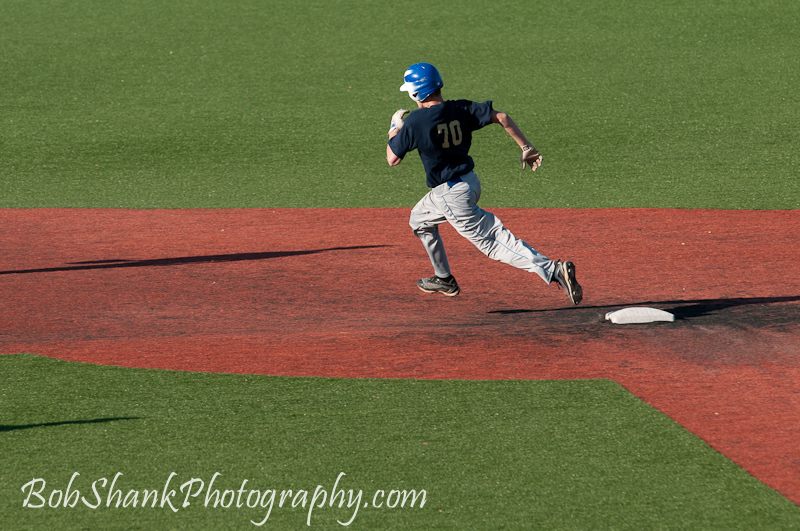 I’d prefer the ball to be a bit more away from the catcher’s mitt, but at least I did capture the moment. 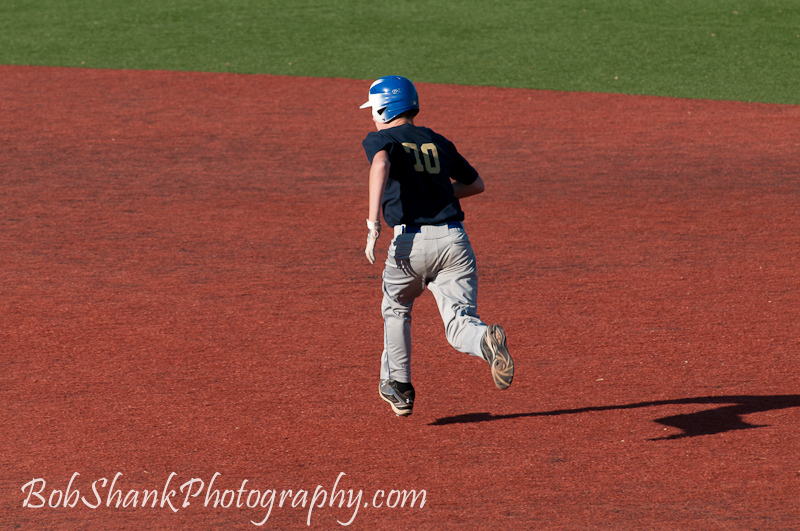 I also like the third baseman in the background to provide some depth to the image. I am liking this perspective. Do you? 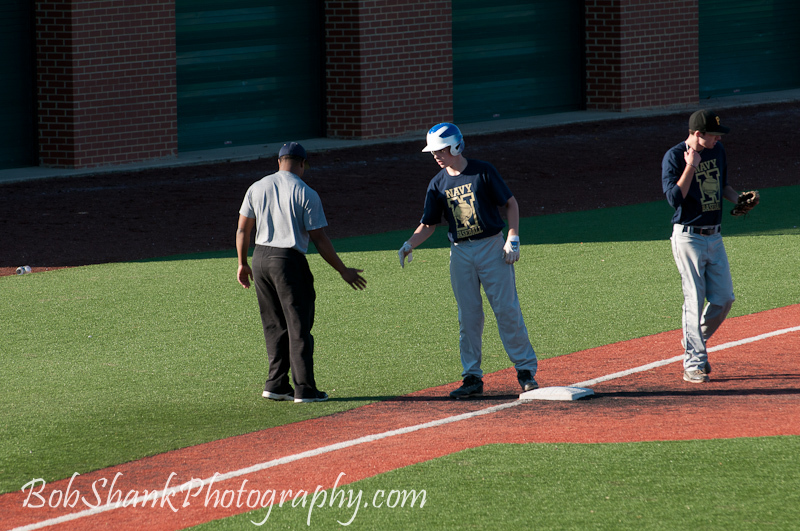 James Shank, a high school sophomore, hit a bomb into right-center field today at the Navy Baseball Showcase Camp. He was facing an extremely good pitcher, who is showing excellent promise himself. This pitcher is a freshman at West Virginia University now and is hoping to transfer to Navy. From the looks of it, he will be a very nice addition to the team here. James worked a 2-2 count and got a fastball. He ripped it in the gap and the ball bounced to the fence. He easily rounded the bases with a standup triple. I thought it would be fun to show the photos from his hit today and break it down so you can see the anatomy of a triple. The hardest part is hitting the baseball, of course, especially against a quality pitcher. The matchup between a pitcher and the hitter is always fun to watch. It’s a cat and mouse game. The pitcher trying to paint the corners of the plate and get ahead in the count; the hitter trying to work the count in his favor and earn a hitter’s pitch. 2-2 is about the same as 0-0, or is it? At the beginning of the at-bat, both the pitcher and hitter are even. They both have room to make a mistake and still live in this matchup. 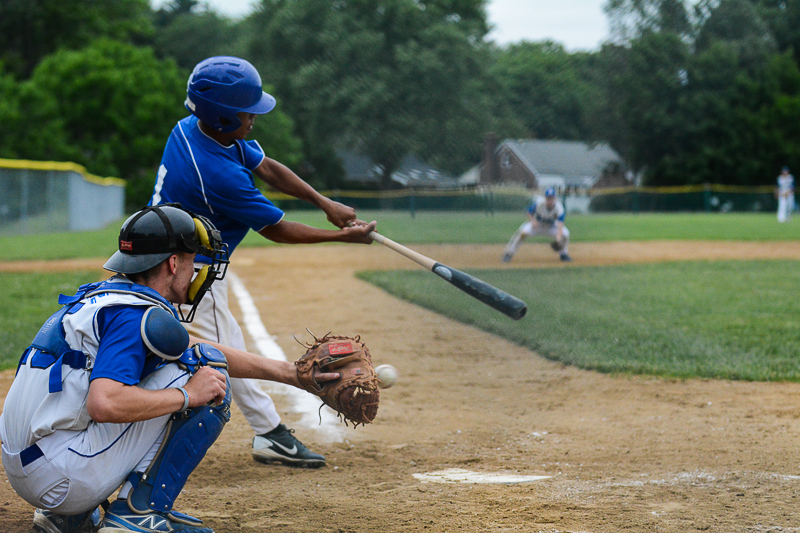 When the count goes to 2–2 the next pitch could be the end of the line for the hitter. Yes, they call this an even count, indicating neither the pitcher or the hitter has the edge, but it seems to me that the pressure is more solidly on the hitter because the next pitch could have him walking back to the bench. All the while, the hitter is working the count and trying to figure out what the pitcher might be throwing. Stay back, look for the fastball, and react to the curve. When the pitcher has a sidearm delivery, it ups the ante even more! Release point is different in this scenario and the hitter has to adjust. 2 balls, 2 strikes. What will the pitcher throw next? It’s a fastball and it’s a triple! The hitter was 1 for 2, batting .500 for the day, and the pitcher strikes out the next batter faced. 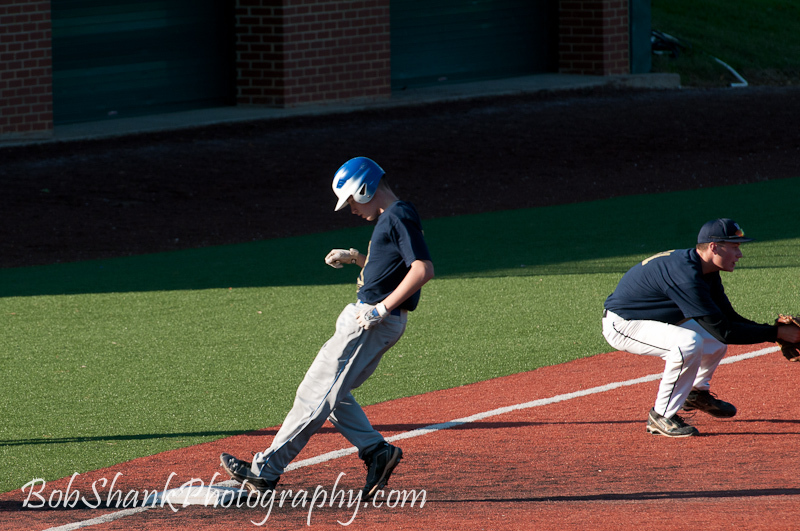 These photos do not show all the drama of a triple, but they do show some of the energy and excitement of a player hitting the ball and rounding the bases, who then cruises into third and shakes the hand of the third-base coach. And that’s the anatomy of a triple.